The Hospitality Newfoundland and Labrador logo depicts the many facets of Newfoundland and Labrador’s tourism industry through five waving panels attached to a clothesline. From Gros Morne in the west to the First Nations in Labrador, many symbols synonymous with this diverse province are pictured. Hospitality Newfoundland and Labrador (HNL), the provincial Tourism Industry Association, is focused on advocacy, education, the adaptation of innovative technology and the promotion of a strong member network. Through forward thinking and the fostering of the growth of its members, HNL continues to be the leader of the tourism industry in the province. 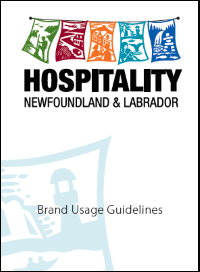 Branding for Hospitality Newfoundland and Labrador was created by John Atkins & Co.